Scientists have spent decades trying to build flexible plastic solar cells efficient enough to compete with conventional cells made of silicon. To boost performance, research groups have tried creating new plastic materials that enhance the flow of electricity through the solar cell. Several groups expected to achieve good results by redesigning pliant polymers of plastic into orderly, silicon-like crystals, but the flow of electricity did not improve. Recently, scientists discovered that disorder at the molecular level actually improves the polymers' performance. Now Stanford University researchers have an explanation for this surprising result. Their findings, published in the Aug. 4 online edition of the journal Nature Materials, could speed up the development of low-cost, commercially available plastic solar cells. "People used to think that if you made the polymers more like silicon they would perform better," said study co-author Alberto Salleo, an associate professor of materials science and engineering at Stanford. "But we found that polymers don't naturally form nice, well-ordered crystals. They form small, disordered ones, and that's perfectly fine." Instead of trying to mimic the rigid structure of silicon, Salleo and his colleagues recommend that scientists learn to cope with the inherently disordered nature of plastics. In the study, the Stanford team focused on a class of organic materials known as conjugated or semiconducting polymers – chains of carbon atoms that have the properties of plastic, and the ability to absorb sunlight and conduct electricity. Discovered nearly 40 years ago, semiconducting polymers have long been considered ideal candidates for ultrathin solar cells, light-emitting diodes and transistors. Unlike silicon crystals used in rooftop solar panels, semiconducting polymers are lightweight and can be processed at room temperature with ink-jet printers and other inexpensive techniques. So why aren't buildings today covered with plastic solar cells? "One reason they haven't been commercialized is because of poor performance," Salleo said. "In a solar cell, electrons need to move through the materials fast, but semiconducting polymers have poor electron mobility." To find out why, Salleo joined Rodrigo Noriega and Jonathan Rivnay, who were Stanford graduate students at the time, in analyzing more than two decades of experimental data. "Over the years, many people designed stiffer polymers with the goal of making highly organized crystals, but the charge mobility remained relatively poor," Salleo said. "Then several labs created polymers that looked disordered and yet had very high charge mobility. It was a puzzle why these new materials worked better than the more structured crystalline ones." To observe the disordered materials at the microscopic level, the Stanford team took samples to the SLAC National Accelerator Laboratory for X-ray analysis. 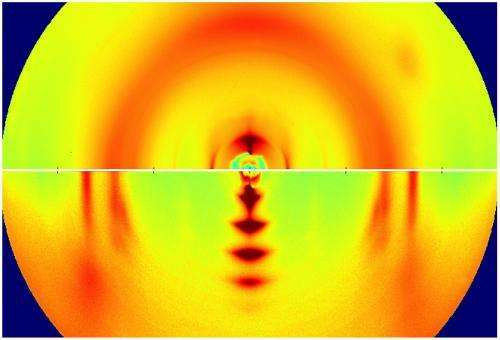 The X-rays revealed a molecular structure resembling a fingerprint gone awry. Some polymers looked like amorphous strands of spaghetti, while others formed tiny crystals just a few molecules long. "The crystals were so small and disordered you could barely infer their presence from X-rays," Salleo said. "In fact, scientists had assumed they weren't there." By analyzing light emissions from electricity flowing through the samples, the Stanford team determined that numerous small crystals were scattered throughout the material and connected by long polymer chains, like beads in a necklace. The small size of the crystals was a crucial factor in improving overall performance, Salleo said. "Being small enables a charged electron to go through one crystal and rapidly move on to the next one," he said. "The long polymer chain then carries the electron quickly through the material. That explains why they have a much higher charge mobility than larger, unconnected crystals." Another disadvantage of large crystalline polymers is that they tend to be insoluble and therefore cannot be produced by ink-jet printing or other cheap processing technologies, he added. "Our conclusion is that you don't need to make something so rigid that it forms large crystals," Salleo said. "You need to design something with small, disordered crystals packed close together and connected by polymer chains. Electrons will move through the crystals like on a superhighway, ignoring the rest of the plastic material, which is amorphous and poorly conducting. "In some sense, the synthetic chemists were ahead of us, because they made these new materials but didn't know why they worked so well," he said. "Now that they know, they can go out and design even better ones." And Salleo offered a final piece of advice. "Try to design a material that can live with as much disorder as possible," he said. "Take the disorder for granted. Personally, I really like disorder. Just look at my office."